Chuck Sheley is a fisherman. Not only does he fish, Chuck catches fish. Not only does he catch fish, Chuck catches big fish. Since November of 1996, Chuck and I have spent a week each year fishing together in Florida with great fishing friends. Originally, our trip centered in Marathon. We chased bonefish, permit and tarpon around the Florida Keys. We were blessed to have great fishing guides for each of those years. Steve Huff, Dustin Huff, and Dale Perez provided us with many shots at great fish, poled into the wind, took us out in good and bad weather, encouraged us, and offered their abundant expertise on the saltwater flats for our benefit. Our annual trip moved to the Everglades last year. Although Chuck could call Florida his fishing capital, he is from Ohio and has fished all over the world. He is extremely humble about his angling accomplishments but has graciously given me permission to brag about him a little bit. I must admit that as I write, it is easy to live vicariously through his angling accomplishments. Part of the fun of each year’s Florida trip was bantering with one another as we negotiated the small side bets on the biggest fish of each day and week. Inevitably, when folks stand side-by-side on a bonefish skiff, or bass boat, bragging rights and a few bets are at stake. Obviously, the rest of us on the trips were optimists because we made the same losing bet each year on the largest fish even though Chuck kept winning. Chuck almost always releases his fish. If he cannot get a fish to the boat quickly enough to suit him, he frets about its health. If a fish is hooked deep, he is upset. If a shark tracks down a hooked bonefish or permit and eats it, he may not speak for hours. So in return, perhaps as Steve Huff has eloquently written in the article which I have republished below, the fishing Gods have on occasion blessed Chuck because of the positive and joyous attitude he brings to fishing. Chuck has caught the largest bonefish on the boat of Capt. Dale Perez, who has fished in the Florida Keys for well over 30 years. Chuck was fishing with friend, Lee Mitchell at the end of the angling day on Nine Mile Bank which is located in Florida Bay. Florida Bay is such a shallow body of water that a depth of 6 feet is considered a canyon. The Bay is a series of basins which are separated by mud banks. These banks restrict the flow of water as the tide comes in and out. Nine Mile Bank is one of the first barriers to the flow of water at the westernmost point of the day. Historically, it has been a tremendous fishing area. However, finding fish can be difficult because the salinity, oxygen level, forage and temperature very greatly from basin the basin. On this day, however, fish were tailing and waking as they came on to the mud bank covered with lush turtle grass with the incoming tide. Chuck and Lee were watching a school of three very large bonefish. They were moving slowly towards the skiff and at the last possible moment Chuck cast his shrimp in front of the three fish school. A huge bone picked up the shrimp and took off. Chuck’s recollection of the fight is of course dimmed by the reality of this huge once-in-a-lifetime catch. There is much speculation that the bonefish may have weighed as much as 18 pounds and been a world record on 10 pound test. Take a close look at the photograph and you will see the extremely large girth of the fish and the fact that Dale’s hand does not fit around the tail of the fish. 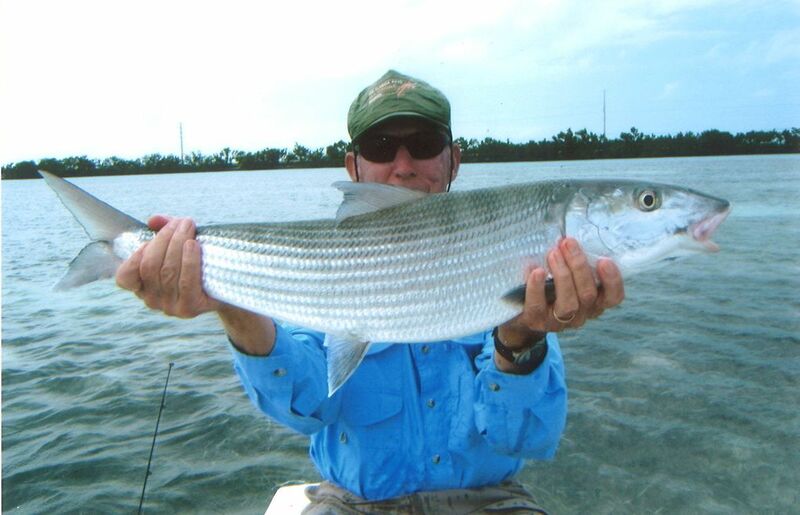 Chuck has also caught the largest bonefish on the skiff of Capt. Dustin Huff. This fish was caught in just off Duck Key. Dustin weighed the fish at 13 1/4 pounds on IGFA approved scales. 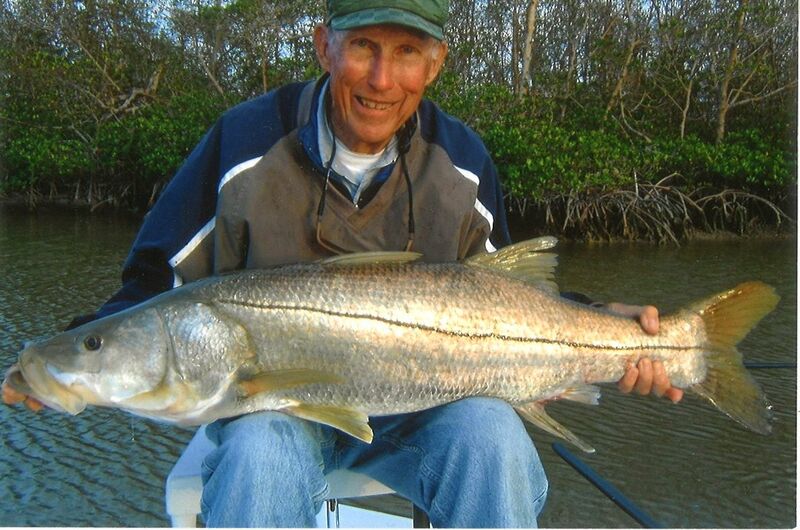 Chuck has caught the largest snook which IGFA Hall of Fame Guide, Steve Huff has ever touched. Chuck was fishing in January of 2005 in the Everglades with Steve at the time of the catch. The snook weighed 32 pounds and was 44 inches in length. On that same trip, Chuck caught a 14 1/2 pound snook on fly. All of us who fish tell stories about the fish we have caught. Once in a while we have proof that the stories are true. I hope you enjoy the photographs and article which demonstrate much more eloquently than I can describe in my words the great skill, determination, and effort which Chuck has expended in pursuing his sport. So, fellow anglers, I encourage you to keep fishing… a lot. Who knows, the fishing gods may bless you with a little luck of your own! This entry was posted in Fishing Stories and tagged Chuck Sheley, Dustin Huff by Tarpon Slam. Bookmark the permalink. THE SECRET TO FISHING IS TO FISH WHERE THE FISH ARE. FISH OFTEN MY FRIENDS.